Earlier this year Eric Daniels (the one-time CEO of the Lloyds Banking Group) successfully sued his ex-employer for an unpaid #bonus of £1.3 million worth of shares. Litigation of this type outside the financial services sector is thankfully rare, but bonuses do often lead to disagreements, particularly when people leave. I remain amazed how documentation is often drafted casually, if at all, and how bonus arrangements continue year after year with very little thought about their effectiveness. If this rings bells for you – read on. Bonuses have long been a part of the pay landscape, with very little evidence about their effectiveness as a motivator. Wikipedia describes a bonus as ‘an extra payment for doing one’s job well’, and supporters will argue that they reinforce desired behaviours such as a focus on profitability or sales. In reality, many bonuses are only loosely linked to individual performance, and critics will argue that unless there is a clear ‘line of sight’ between the objectives (levels of profitability, sales, effecting change etc.) and the contribution made by individuals, the prospect of a bonus will not influence behaviour in the job. They are often little more than a deferred payment. Detractors will also argue (following in a Maslow/Herzberg tradition) that it is the intrinsic value of the job that motivates, and quote numerous studies where reward comes well down the list of priorities as a motivator. For employees they can be unpredictable, often don’t count towards pay for the purposes of obtaining a mortgage, and they are usually non-pensionable. On this latter point, care should now be taken to ensure that any bonus, regardless of what it says in the contract of employment, will be pensionable if the employee’s pension does not otherwise reach the upper earnings limit of £46,384 (2018/19). If you are offering a final salary pension scheme, you also need to check the scheme rules to ensure that they don’t require bonuses to be pensionable. The CIPD Reward Survey reveals a steady reduction in the number of employers using bonus schemes of one sort or another. Overall 48% of employers used them (43% of SMEs) in 2017, although the decline is probably largely due to the capping of bonuses in the financial services since the 2008/9 crash. 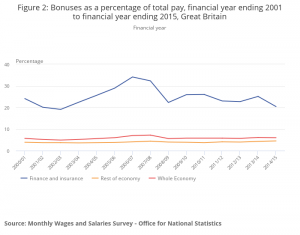 The figures illustrated below show the decline and also that, outside of financial services (Rest of Economy), bonus payments make up about 5% of total pay compared to 20% in financial services (used with permission). What are the different types of bonuses? 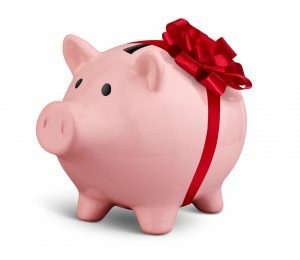 Very often bonuses are related to profitability or sales, meaning that they are only paid if the organisation can afford it, and managers can (within limits – see later comments) exercise some discretion over pay outs. Typically, bonuses relate to individual, team or overall organisational performance (in the latter case usually profit) and can be ‘tiered’ to reflect different levels of achievement. At one time there were tax incentives for schemes that paid all employees a bonus based on profitability, which was thought to encourage an overall focus on the purpose of the enterprise being to make a profit. In Eric Daniel’s case some of the bonus apparently related to the successful integration of HBOS into the Lloyds Group – sometimes known as a ‘project bonus’. Commission is a type of bonus usually contractually paid on a regular basis in relation to individual sales performance. Bonuses are often paid in cash, but in the US, non-cash incentives such as a holiday for the top sales person, or retail vouchers play a prominent part in reward, and share options are often used for senior executives, such as in the Eric Daniels case. Despite the unlikelihood of litigation (outside of the financial sector), here are five tips for ensuring that things go smoothly. 1. Be clear about the the contractual/discretionary nature of the bonus. Outside the financial services sector, contractual bonuses are rare, although they may sometimes be given when an employee joins you, and you guarantee a level of bonus for the first year. The most common bonus arrangements reserve some level of discretion on behalf of the employer, either to award a bonus at all, or to award subject to agreed performance criteria. 2. Avoid acting in an inconsistent manner. Employee’s should be able to trust their employer, and tribunals/courts will be unsympathetic to random or perverse decision making regarding the payment of bonuses, even if discretion has been reserved in the contract. Discretion is not unfettered. Also, unless you reserve the right, you cannot withhold bonuses for other reasons such as the employee being subject to disciplinary action or because you cannot afford it. In instances where substantial bonuses relate to financial performance, companies can reserve the right to clawback payments in the event of it needing to restate its accounts or discovering material wrong doing on the part of the employee. 3. Regularly review bonus schemes so that an employee can’t argue that a particular payment has become contractually binding. Business priorities change over time, and bonuses should reflect changing priorities. The best way to achieve this contractually is to give a right to participate in a discretionary scheme which the Board may vary from time to time. 4. Be clear about what happens on termination (the most frequent cause of arguments!). Commonly, well drafted bonus provisions make it clear that there will be no right to a bonus if the individual has left or is under notice at the time the bonus is payable. Note, the normal payment date may be different from the, for instance, end of the financial year to which it relates (sometimes referred to as the ‘due’ date). There is an argument that if someone has earnt a bonus, they should be paid it, but this is a moral or motivational issue, rather than a legal one. There is certainly the possibility of unintended consequences when it comes to this type of non-payment clause. It can lead to ‘team moves’ where groups of employees leave together as soon as they have received their bonus, and to less effort and interest when someone is working their notice without needing to maintain performance levels previously motivated by the prospect of a bonus payment. 5. Make sure you are fair towards employees on long term leave. This is a complex area, which some employers (although unusually) try to overcome by having an ‘active service’ clause which says that you have to be in service (i.e. not on maternity, parental, long term sick leave etc.) at the time the bonus is payable. The law is not exactly decisive on these types of issues, but generally an employee should not have their bonus affected by being on sick leave (it could give rise to a disability discrimination claim), but it is broadly accepted that bonuses can be ‘pro rated’ for women on maternity leave (and probably men on Shared Parental Leave). Unless you have stated it clearly in the contract, you should take advice about this. 6. Watch oral promises, they may be binding. Whilst Tribunals accept that promises made under the influence of alcohol at the office Christmas party cannot be relied on, other promises where they are quantifiable and clearly intended to be binding will be enforceable. You may not have the €400 million bonus pool exposure that Dresdner Kleinwort had when they were found to have orally promised that amount to employees in 2008, and then tried to rein in the promise by introducing a ‘material adverse change’ clause that had not existed before. In the SME sector agreements are often made orally, so take care. If you currently operate a bonus system, you are unlikely to achieve much by removing it, but you might want to review it to ensure that it is fit for purpose. You may conclude that it is merely a deferred payment, but you may also see opportunities to align it more effectively to the strategic goals of the company. At the very least, you might want to ensure that bonus terms are clear and unambiguous. Through his firm’s ‘ExecutiveHR’ service, Ken also provides telephone-based support services to businesses throughout the UK.